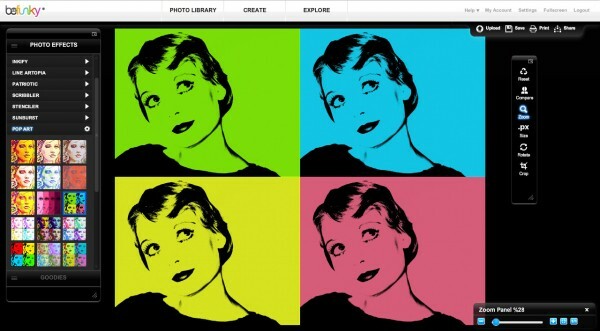 Pop art, short for popular art, emerged in the late 1950s. It was a movement that was influenced by American consumerism, television, movies, and comic books. There were several artists to emerge from the pop art movement; however the style that was uniquely Andy Warhol‘s is the most recognizable. Reprints of his portraits featuring celebrities of the era continue to be quite popular. It’s not unusual to find his prints hanging in modern or retro homes and offices. With BeFunky, you can turn all your favorite images into pop style pieces of art, suitable to hang on any wall, print on a variety of products or to post to your Internet profiles. 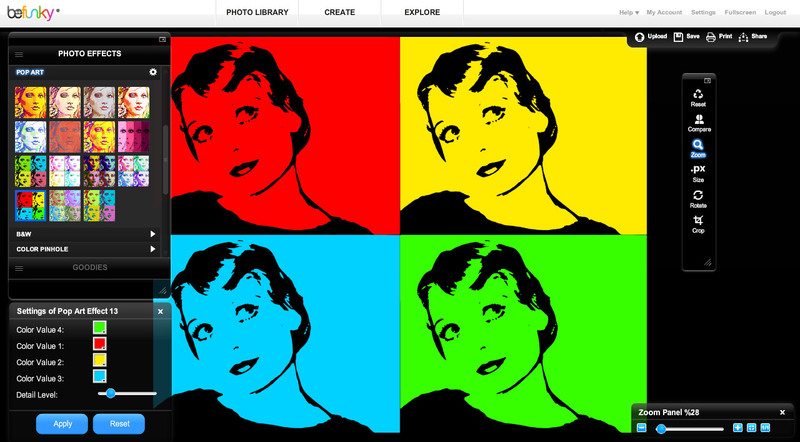 In fact, you will be so impressed with the results, you may want to turn all your friends pics into pop art photos! Wouldn’t it be fun to surprise your friends with pop art gifts featuring their own likenesses? Most pop art artworks borrow subjects from pop culture of the 1950’s and 60’s—famous people and mundane products. Try using a photo of your favorite star, or maybe your new iPhone. Or, make yourself the subject of a pop art painting. To get the best effect, your image should have a simple, solid-colored background. To get started, just upload your photo. When your image appears on-screen, you can use the cropping tool to zoom in tighter. This is a good way to crop out any distracting background clutter. Next, choose Pop Art from the Artsy menu on the left. The menu will expand, displaying different pop art effects. Select one to start the modifications to your photo. 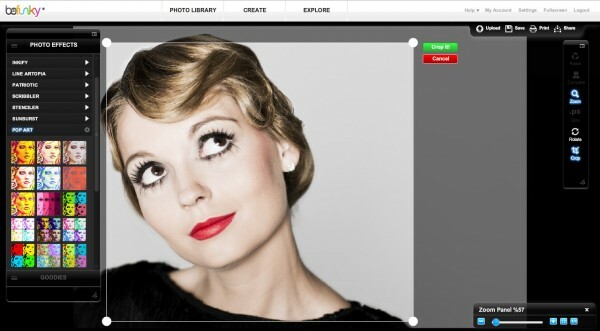 The BeFunky progress bar appears while your image is modified with the chosen style. It won’t take long. Soon your modified image will appear on screen. Voila! You have created a pop art masterpiece! But don’t stop there. You will want to experiment! Click Settings in the tools menu to open the Settings pop-up. Each pop-art effect has a different combination of settings for you to experiment with. Most are changed with a slider control. Changing Sketch Detail, Detail Level, and Silhouette Amount modifies details and contrast. Colors can be modified by changing Brightness, Color Space or Color Value settings. You can vary the intensity of the newsprint quality with the Halftone Size control. Experiment with the available settings to discover how they alter your image. You can always return to the original settings by clicking Reset. When you are happy with the results, use the buttons at the top right menu to save, share or print your new creation. 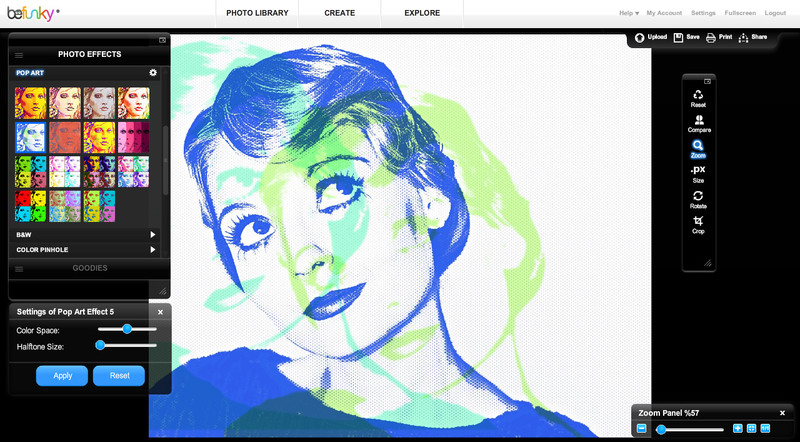 Ready to turn all your photos into pop art?